Ashima and Leena is a well renowned label in the Indian and global fashion industry. Over the years, it has become one of the most recognized label, not at a national level, but has also scaled heights internationally. The brand depicts the royal Indian heritage, deep rooted in its cultural form and aesthetic, tradition and legacy. Today, the Ashima and Leena label, projects itself at the helm of Indian fashion, and has successfully completed ten years within the industry. The Ashima and Leena label has a unique, distinctive style and an original, traditional appeal. The brand’s design philosophy strives to bring out the best in every woman through ensembles that are traditional and contemporary. An established and well-reputed label, the designs speak of tremendous hard work and superb craftsmanship. With a product range that includes a large variety and assortment of fabrics, silhouettes, colors and embroideries, the styles range from smart casual to the ornately formal. Lending a stunning color sensibility, the color play is reminiscent of the Ashima and Leena label. Emphasis on quality, attention to detail, fabric development and intricate, ostentatious embroideries are the hallmarks of the creativity behind the brand. Ashima is a B.Com. (H) Graduate from Shri Ram College. She passed out from NIFT (2nd Batch)-winning The Best Student Award. Leena on the other hand, is a graduate in English (H) with Master’s in English Literature and a Lawyer in Income Tax. 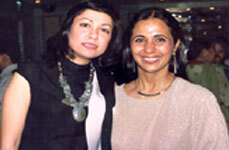 Set up in 1993-a success story of two sisters-in-law, a unique combination of a designer a marketeer- Ashima and Leena. With Ashima spearheading the designing and Leena, the marketing pioneer behind the brand, are dedicated in their efforts to promote India and its tertiary industry. With their combined strengths, their business growth has been phenomenal and they believe in borrowing inspiration from our land, its rich heritage, art and design. A diverse approach manifests itself in their creations, which spans across the royal Indian costumes of the 18th century, through to the modern, cutting-edge styling of today. Hand embroideries being their forte, they specialize in Bridal wear creating exquisite and delicately handcrafted masterpieces that are classic and timeless, ensembles that can be passed on to generations. Theirs is a promise to preserve the Indian tradition, the legacy of the Indian craftsman. They have a long way to go, but with them they will carry the heirloom, the weaves, the zardozi, the nakshi, the kasab. The brand emplyees around 170 craftsmen, masters, cutters, hand embroiders, tailors, quality check-production managers. The Premise boasts of 150 machines, which are involved in creating the designs by Ashima, which satiate the aspirations of thousand of people around the world. The brand has an exclusive exhibit in Dubai, UK and the USA. In India, Ashima – Leena have a tie up with VAMA & KIMAYA in Mumbai, where their lines have a separate exclusive exhibit. Ashima-Leena retail from their own studio in Delhi-Besides their Store in the Hottest Fashion Mall, 1 MG Road in New Delhi. Ashima – Leena have their strong presence in U.S.A from last many years. Over the years they have built their strong clientele of around six thousand people. They now plan to open their own stores ‘Ashima – Leena’ in six different cities of U.S.A starting from New York and Sanfracisco.